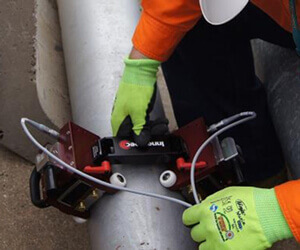 A single or double sensor is scanned axially on the pipe to measure attenuation and/or velocity changes in the signal due to corrosion, cracks or other defects on the supported bottom. Ideal when access to the top of the pipe is possible and to complement circumferential scanning from the side. Axial scanning provides circumferential inspection of the pipes. Complements circumferential scanning from the side of the support. Provides inspection on rough and corroded surfaces and when covered with thin wraps and coatings (<3mm-0.125”). Permits inspection of pipes from 1” to 36” accessing only one point around the diameter of the pipe. Larger diameter pipes can be covered with multiple passes. Manual and motorized solutions available.